Aaron, the home’s current occupant, has lived there for 4 years with his young family. He immediately engaged with me in conversation wondering about the home’s history. 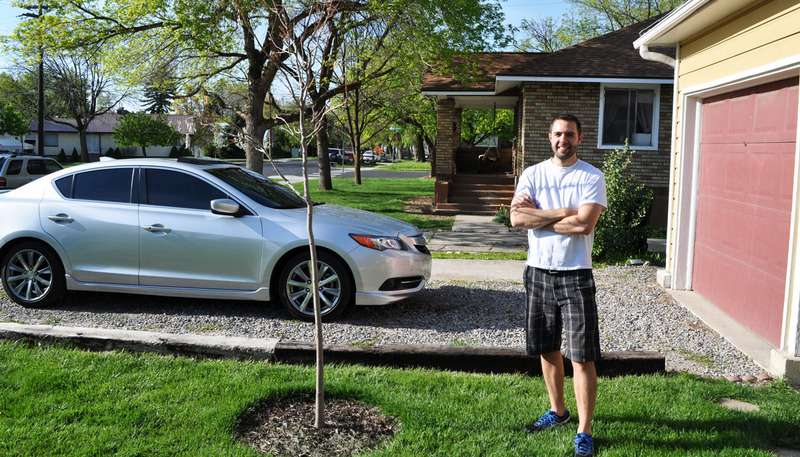 “This home used to be at the far north end of town,” he stated. 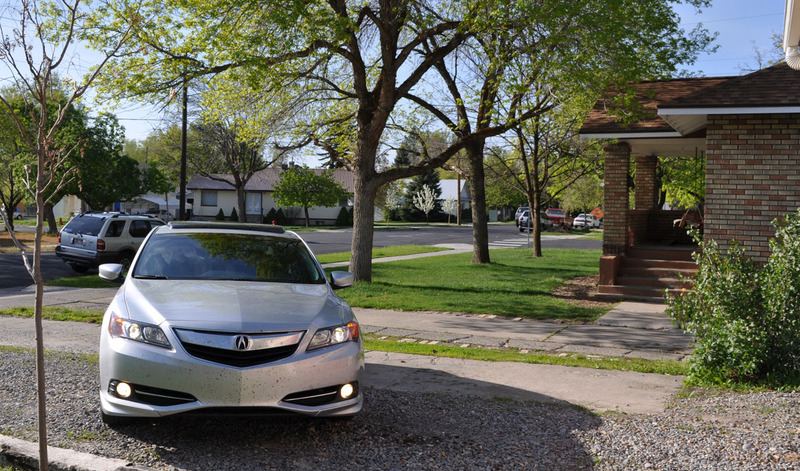 Within 10 minutes, he’d pulled both of his vehicles out of the driveway and allowed me to position the ILX there at an angle, much like my grandpa had done with his 1950 Buick Special. Out of respect for Aaron’s lush green lawn, I decided not to ask him about driving over it as my grandpa had done to his family’s lawn in 1954. I’ve often times gone to great lengths before to re-create photos – like that time in September 2011 when I stopped at the Nevada / Arizona border in the Legend and positioned the car so that it would be sitting just like my the Buick was. 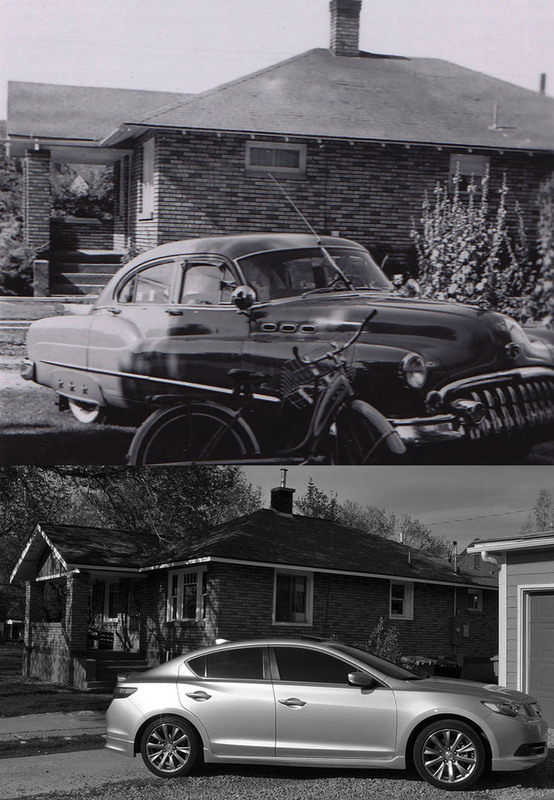 So here we are with a “then and now” look at the 1950 Buick and the 2013 Acura in about the same position. 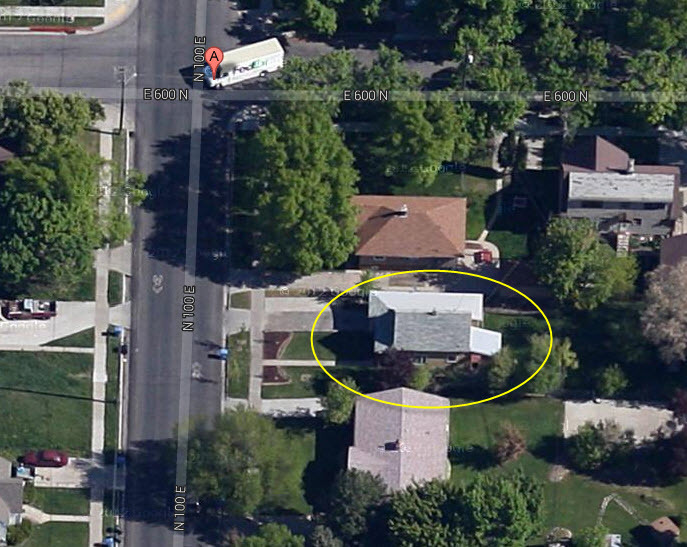 I got on Google Maps / street view and easily identied its location. Here’s the original picture. It’s only about 2″ by 3″ in size. Another angle. 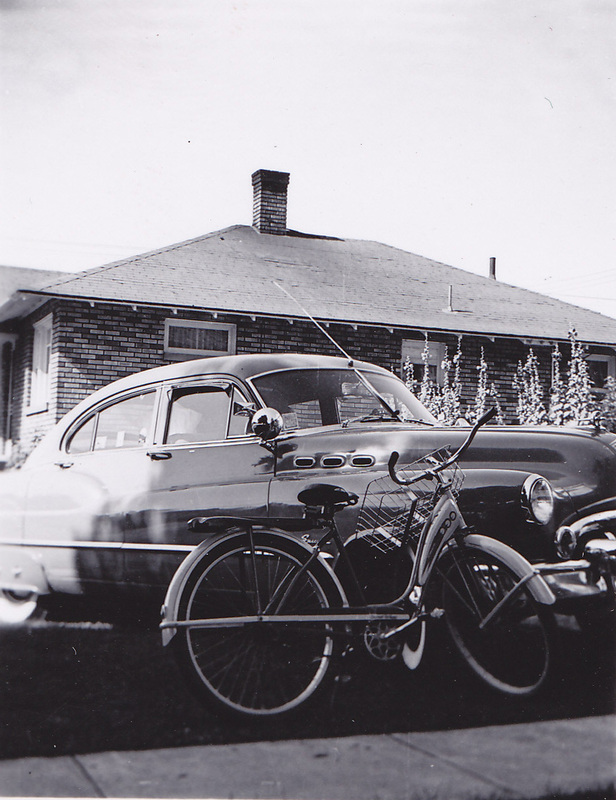 I wonder what was so special about that bike? 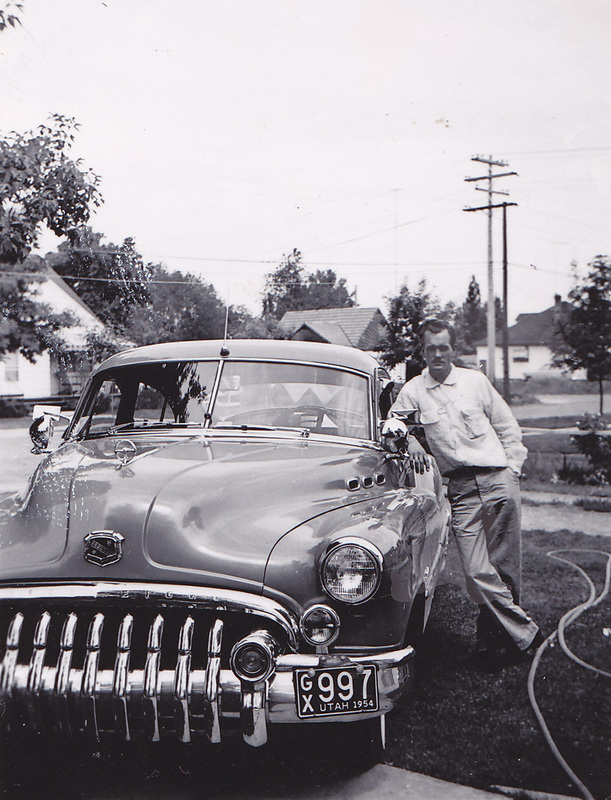 And grandpa standing proudly with his “Jetback” Model 43D sedan. Chrome, anyone? The power pole from the above pic can be seen in the below. Follow the passenger headlight up. Huge thanks to Aaron and his family for giving me an insightful look (both inside and out) at the home where my grandpa lived in his 20’s. Onward I go for some more northern Utah / southern Idaho adventures! Stay tuned. This entry was posted on May 3, 2014 at 8:05 am and is filed under Throwback, Utah. You can follow any responses to this entry through the RSS 2.0 feed. You can leave a response, or trackback from your own site. thats awesome Tyson. I wish I had been better about taking more pictures along the way. I’m glad that Adam was able to help you out. Definitely! 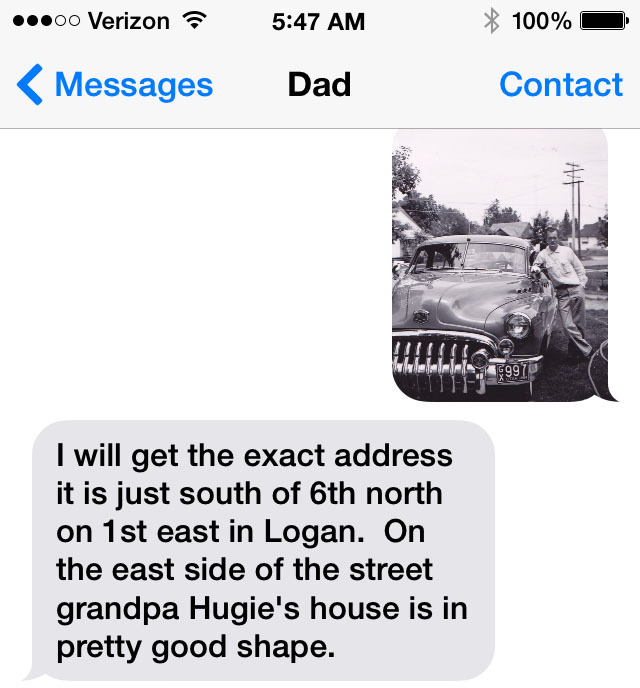 Yeah I love any clues that can help me piece together a little bit of family history. I have to correct my article though – the gentleman’s name was Aaron, not Adam. Fixing that now! Thanks Dave. 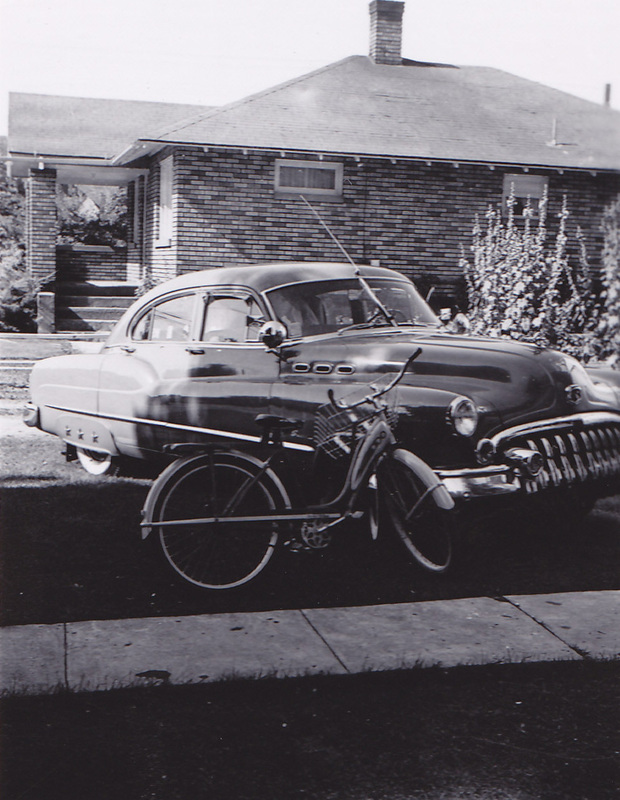 The old car is awesome, but it’s that old bike with which I am intrigued!